This stunning Parisienne classic Art Deco style furniture enhances any home interior decor. Featuring a strong metal frame with antique gold finish and Silver Gilt Leaf Metal. A mirrored top surface, this pieces of furniture will be sure to attract many admiring glances from your guests. 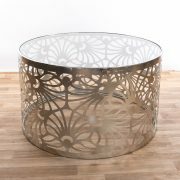 View Basket “Gin Shu Round Silver Gilt-Leaf Metal Coffee Table” has been added to your basket.